Portrait of François Capois "La Mort". 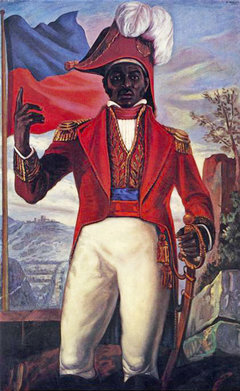 The Haitian Act of Independence (French: Acte de l'Indépendance), declaring former Saint-Domingue independent from France, was drafted by Boisrond Tonnerre and read by Jean-Jacques Dessalines on the Place d'Armes of Gonaïves on January 1, 1804. This marks the beginning of independence for Haiti. Actually, the first declaration of independence was read in Fort-Dauphin on November 29, 1803; it was signed by Dessalines, Christophe and Clerveaux and drafted by B. Aime. 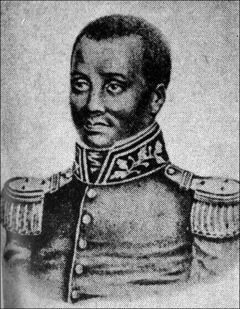 Of note, all of the "chiefs of Saint-Domingue" who signed the first ringing declaration at Fort-Dauphin had been generals of Leclerc 14 months before. Also of note it spoke of St. Domingue while the name was changed to Haiti in the one that was proclaimed in Gonaives. Act of Independence (French) - French text of the declaration of independence. French Capitulation in Saint-Domingue - Document from November 19, 1803. Haitian Declaration of Independence at The National Archives (UK) - Page contains background information and a link to a high-resolution copy of the document. Proclamación de la Independencia de Haití - Spanish translation of the Haitian Independence Declaration. This page was last modified on 4 January 2012, at 18:50.